Needing a fresh start, Stanley Washburn and his daughter, Susanna leave Philadelphia for Red Gorge, Dakota Territory. Stanley’s nephew, Jared Hopkins has arranged for his uncle to purchase The Lucky Seven Saloon, but Susanna isn’t sold on life in Red Gorge. The town’s banker, Percy Benjamin has been murdered, and Marshal Seth Davis is called in to solve the crime. 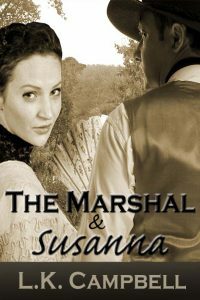 The last thing on Susanna’s agenda was to become involved in a murder investigation, but Jared has become the marshal’s prime suspect. Together, Susanna and Seth might find the real killer and a new relationship with each other. I’m a lifelong lover of the written word both as a reader and as a writer. My professional writing career began with a weekly newspaper column for my hometown newspaper where I worked for 21 years. I began writing fiction in my early twenties, choosing the romance genre because it was my favorite genre to read. In recent years, I’ve become addicted to cozy murder mysteries and love reading them in my spare time.